Confident and versatile, the Eurodisc single-lever kitchen faucet complements a variety of kitchens in both look and functionality. At 7-3/16 in. in height, it is ideal for installation under a window, and a generous 9-5/8-in. swivel spout reach ensures easy accessibility. The spout terminates in a pull-out spray head that features locking spray control and a push button that, when pressed, allows users to transition between two spray modesregular flow and spraywith ease. The spray nozzles are protected against limescale buildup with GROHE SpeedClean technology. The top-mounted lever handle provides precise one-finger control of the water temperature and volume, thanks to a GROHE SilkMove for a lifetime of smooth operation cartridge. Eurodisc is available with a 1.75-GPMwater flow in lustrous GROHE StarLight finish for scratch and tarnish-resistant surfaces for a lifetime of beauty chrome, which will not scratch or tarnish, ensuring a mirror-like shine for years to come. The Arbor line delivers streamlined and timeless transitional styling that meets personal preferences and houses a host of performance features that make Arbor extremely flexible and friendly to use. This Single-Handle High Arc Kitchen Faucet shows that Moen is dedicated to designing and delivering beautiful products that last a lifetime. All Classic Stainless faucet components feature the LifeShine Non-Tarnish Finish. The MOEN Arbor Eco-Performance single-Handle Pull-Down Sprayer Kitchen Faucet in Chrome offers extended versatility without the need for a separate side spray. It features MotionSense technology that activates the water flow with simple hand movements. Accomplish routine tasks with greater speed and efficiency with this convenient, hands-free control. This faucet is also equipped with Reflex, a comprehensive system of features and design enhancements that give you smooth operation, easy movement and secure docking of the pull-down sprayhead. 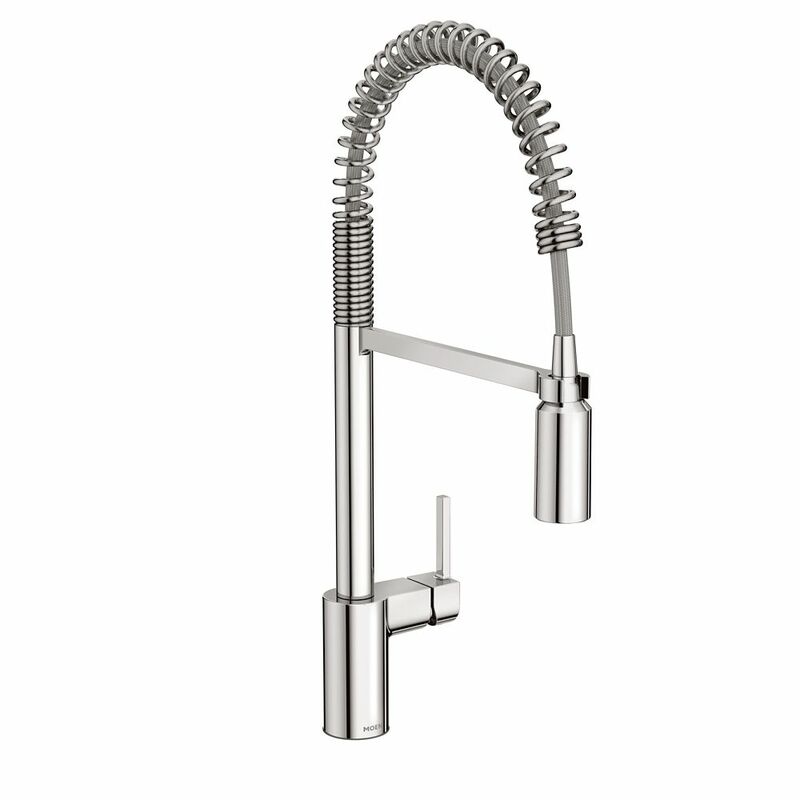 Align Single-Handle Pre-Rinse Spring Pulldown Kitchen Faucet in Chrome From intimate galley kitchens to large gourmet workstations, Align faucets bring a refreshed, modern look to your home. Simple lines create the contemporary style, while a pulldown wand delivers in-demand functionality. Align Single-Handle Pre-Rinse Spring Pulldown Kitchen Faucet in Chrome is rated 4.7 out of 5 by 22. Rated 5 out of 5 by Mk from Beautiful faucet. Sturdy, well made. Absolutely loving the look and feel. Most importantly I'm lo... Beautiful faucet. Sturdy, well made. Absolutely loving the look and feel. Most importantly I'm loving using it. As a side note, deck plate is sold separately. I didn't order, thinking I would install without. Unfortunately once we removed existing faucet, 3 holes were revealed. Should have checked beforehand :) Home Depot doesn't carry the deck plate in store so had to order which took a few days. Rated 3 out of 5 by NP from The hose is too lose. It doesn’t stay intact in... The hose is too lose. It doesn’t stay intact in the holder. It just dangles down lose. Rated 5 out of 5 by JimK69 from This faucet although somewhat expensive is worth every penny. If you're looking for a high qualit... This faucet although somewhat expensive is worth every penny. If you're looking for a high quality, great looking, easy to install pull-down type faucet this is it! It totally transformed our kitchen sink. Rated 3 out of 5 by Vicki from Some of the parts of the faucet are not made... Some of the parts of the faucet are not made of metal (like the pull out spray head). It also shows water spots on the non metal parts. Rated 5 out of 5 by Christopher from Great product and delivery on time!... Great product and delivery on time!